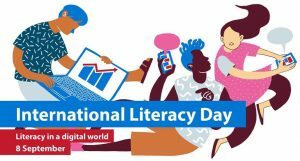 International Literacy Day, celebrated annually on 8 September, is an opportunity for Governments, civil society and stakeholders to highlight improvements in world literacy rates, and reflect on the world’s remaining literacy challenges. The issue of literacy is a key component of the UN’s Sustainable Development Goals and the UN’s 2030 Agenda for Sustainable Development. The UN’s Sustainable Development Goals, adopted by world leaders in September 2015, promotes, as part of its agenda, universal access to quality education and learning opportunities throughout people’s lives. Sustainable Development Goal 4 has as one of its targets ensuring all young people achieve literacy and numeracy and that adults who lack these skills are given the opportunity to acquire them. This year’s theme is ‘Literacy and skills development.’ Despite progress made, literacy challenges persist, and at the same time the demands for skills required for work, evolve rapidly. This year’s theme explores integrated approaches that simultaneously support the development of literacy and skills, to ultimately improve people’s lives and work and contribute to equitable and sustainable societies. The day focuses on skills and competencies required for employment, careers, and livelihoods, particularly technical and vocational skills, along with transferable skills and digital skills.